Interactive content is all the rage these days. The variety of tools and solutions to make your content interactive keeps growing, and there is little doubt that interactive content can support your marketing initiatives in many ways. In this article, we will take a deep dive into what interactive content is and its benefits. We will also review some of the steps you might take to get the most out of interactive for you and your clients. Interactive content is nothing new. From pop-up books to choose-your-own-adventure novels, print had been experimenting with interactivity for years. But the emergence of digital brought a whole new dimension to what interactive is capable of. The advent of touchscreen technology, driven by global adoption of smartphones and tablets, has cultivated a general expectation of interactivity. As Kissmetrics put it in a recent article, apps and widgets are just inherently more engaging than static web pages. And the research supporting digital interactive is compelling. A study by Demand Metric from 2014 found that interactive content reliably outperformed static in terms of buyer education, pathway to conversion, and overall shareability. Follow-up research from Demand Metric published in 2018 confirmed the trend. So the power of interactive was clear before digital was even a thing. What has changed in the past few years is that interactive has matured. Let’s start by outlining some of the benefits of interactive content: how does it help achieve your marketing goals? If you start interacting with something, you are by definition more engaged than before you started interacting. Interaction is synonymous with engagement. It reveals the depth of your engagement. The more heavily you interact with the content, the more interested you presumably are. It increases online stickiness by promoting time on site. Research shows that people routinely spend longer engaging with interactive content than with static content types. Users are able to disclose information about themselves in a controlled and non-threatening way. Users learn about your products and services in a dynamic, personalized, self-paced manner. It is great for social sharing and paid promotion. Interactive content gets shared on average more than static. 96% of participants believe that content interactivity impacts buyers’ decisions as they go through their journey. 90% of respondents say that interactive content is either somewhat or very effective in educating buyers. This compares with 65% who said the same for static content. People are more willing to share interactive content by a margin of almost 30 percent. Demand Metric’s chart on customers’ engagement with passive and interactive content. 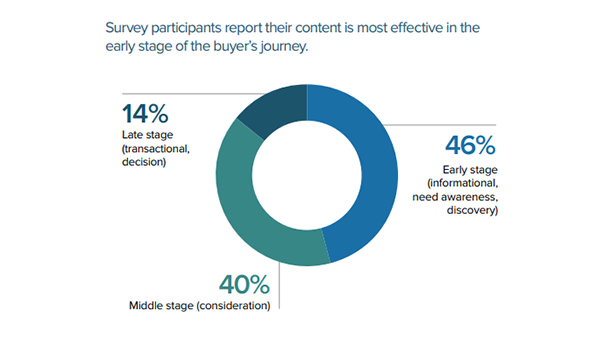 Respondents to the Demand Metric survey also reported that interactive content is particularly helpful at the early and middle stages of the purchase pathway. Interactive content moves people along the buyer’s journey in a more confident and engaged way. 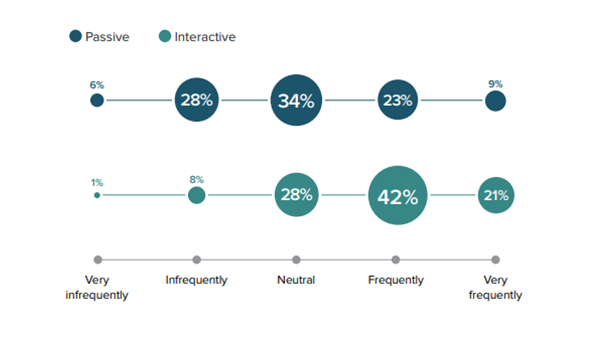 Demand Metric’s chart on customers’ responses to interactive content during the buyer’s journey. The business case for interactive content appears strong. 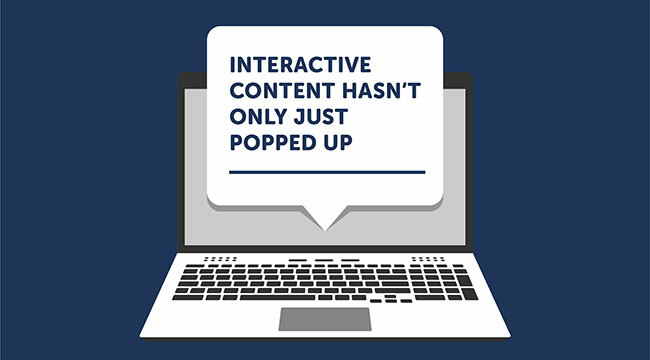 But what does interactive content actually look like? Let’s take a tour through some of the different forms that interactive content takes. One of the most popular of content types, quizzes are inherently interactive. A study by Buzzsumo found that two of the ten most shared pieces of content on Facebook in 2017 were quizzes: the first a quiz from Women.com on identifying grammar errors, and the second a quiz to determine the best state to live in dependent on your personality. The grammar quiz ranked number 4 in the overall list with 5.4 million total interactions, and the personality quiz ranked number 7 with 3.1 million total interactions. It turns out people really like quizzes. Questionnaires are similar to quizzes just more geared toward promoting product and services. An insurance company may run a questionnaire in order to recommend you particular policies. An auto dealer asks you questions about where you live, your driving behaviour, and your budget in order to suggest makes and models of cars. A government agency asks qualifying questions to determine your eligibility for a programme. In each case, it might be the online questionnaire that’s guiding the user through the question set but it’s the user who is in control. She can set her own pace, and assess her comfort level with the process step by step. Just make sure you design your questionnaire well. Don’t ask more questions than you need, and save open-ended questions for later in the assessment. Asking questions that are too long, too vague, or just off-base will reduce completion rates. Online calculators are one of the best ways of helping users get an idea of cost for your products and services. Calculators also help users understand how your solution may save them money over time compared with competitor options or the prospect of simply doing nothing. Take the solar panel industry. Companies that install solar panel systems understand that people have literally dozens of questions around set-up costs and potential long-term savings before they even begin to seriously consider such an investment for their household. Calculators can help answer some of these initial questions before the serious research gets underway. Interactive graphics are a fantastic means of stimulating engagement with your user beyond a static design. Interactive designs give users the opportunity to encounter new information while in the driving seat. Take this interactive infographic from National Geographic. It gives comprehensive data about different diets from countries around the world. You can compare average calorie intake between one country and another, and explore different dietary breakdowns on on a country-by-country basis. It’s a great example of how interactive design helps educate your user in an engaging way. Making your videos interactive gives your audience an additional level of control over their viewing experience. Take a look at this interactive product tutorial for cosmetics brand Maybelline. Viewers are asked to choose which scenario–daytime or evening?–and which look they want to learn more about. The interactivity is kept simple, while the opportunity to control your viewing experience within the video is appealing. Making your editorial assets interactive is a powerful way to increase engagement. Take longer-form content such as white papers. White papers are often viewed as dry and technical. Challenge this notion by making the copy interactive. Allow readers to click around different chapters and enter the white paper at the point of their choosing. Ask qualifying questions within the text that direct readers to different but relevant sections of the paper. And create interactive visuals that inform and bring the copy to life. Chatbots are redundant without user interactivity. People are so used to interacting with mobile apps these days, it’s almost second nature. Engage with your live audience and let their input help shape your content. Solicit questions and run polls during your live webinar. Run competitions that requires interaction from your audience. Create bespoke interactive brackets to embed on your site. Go to town with custom calculators. A one-stop shop for creating interactive content. Select your content type from Dot’s full suite of interactive options. A wide range of services supporting your interactive content needs. From charts to infographics, this solution helps turn your visual creative interactive. Customise your maps with photos, video, audio, 360 panorama, and VR. A specialist tool for the creation and publication of custom quizzes. A one-stop shop for creating a wealth of interactive content. A specialist platform for building and running surveys. Get help turning your content into a 360 interactive experience. A variety of tools and tactics to keep your interactive content integrated with your marketing campaigns. According to recent research from the Content Marketing Institute, almost half of marketers surveyed are using interactive content in some shape or form. Digital interactivity isn’t just here to stay: it’s increasingly the way things are done. That said, remember to ensure that the overall content experience for your users is a strong one. Interactivity for the sake of interaction doesn’t cut it. Your quizzes need to be engaging and relevant, your calculators need to provide helpful information, and your interactive video needs to hold your visitors’ attention. The depth and quality of your content development remains as essential as ever.